How well do logged forests recover? 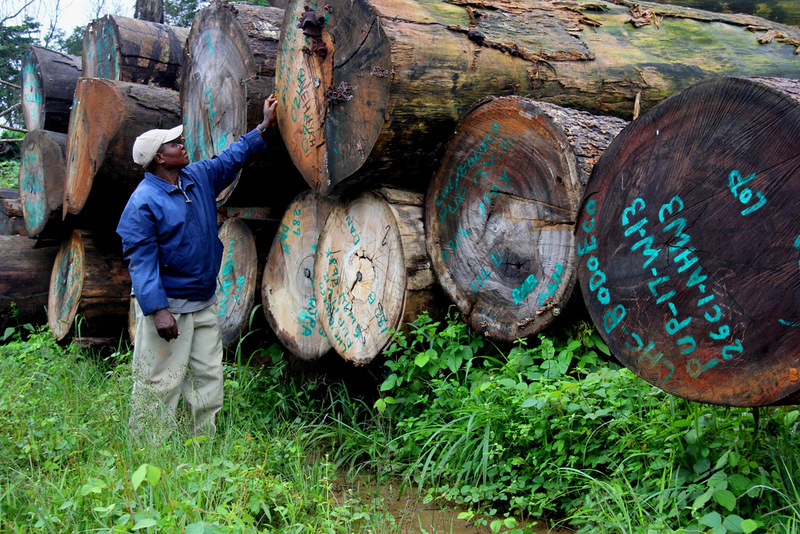 Logging is one of the most widespread threats to tropical forests. It doesn’t seem to be disastrous for forest biodiversity, although that is somewhat unclear as I have discussed previously. However, it does reduce carbon storage because of the removal of trees – causing carbon emissions, which is bad – no matter what some people would prefer you to believe. Even if you think climate change is green hype there are reasons to worry about logging. The time given to logged foreststo recover is often not enough to allow timber species to recover properly. If this is widespread, it would put the long term sustainability of logging practices in the tropics in doubt. Recovery of biodiversity, carbon, timber stocks and a whole host of other things are vital to work out how long forests should be left to recover between each logging period. Despite this there is actually relatively little data on recovery following logging, and this is particularly lacking from Africa. To fill this gap researchers from France, Belgium, Central African Republic and Gabon looked at the recovery of a logged forest in Central Africa over more than 20 years. This involved setting up a logging experiment in the forests near M’Biaki in the Central African Republic, which looks something like this. The area has been monitored for changes in biomass and timber stocks since logging took place in 1984 in forest that was unlogged, logged and logged and then trees thinned out during recovery to encourage growth. Change in (a) aboveground biomass and (b) timber stock over time after logging. Figure taken from Gourlet-Fleury et al 2013. Predictably logging forests sharply reduced their biomass and timber stock, with biomass reduced by about 30% and timber stock by 50%. More interestingly biomass then increased back to levels similar to undisturbed forests in by 2011, while timber stock did not. This is alarming because this forest was logged much less intensively than those on other continents, but still did not recover its timber stocks. We should be worried by this. It means that even at the relatively low intensities of logging that happen in Central Africa, it might not be sustainable. The authors’ argue that in order to make logging more sustainable the diameter at which trees are cut should be increased, whilst encouraging thinning to promote regrowth. I agree. However, we also need innovative solutions that go beyond those proposed already. Reduced Impact Logging, which aims to reduce the amount of damage done to non-timber trees may help carbon stocks, but is less likely to aid timber stock recovery. A possible solution for tropical logging may be a combination of reduced logging techniques with planting of timber species which have been grown off site, in a similar way to that done by restoration projects. This could be lead by more researchers engaging with logging companies and encouraging projects to benefit sustainability of biodiversity and timber. At the moment the problem of logging is similar to that of fisheries: forests provide a resource that is difficult limit access to and is difficult to track once exploited. As well as improving logging practices it is vital that we improve governance, but if I knew how to do that I wouldn’t be sat here writing a blog for free. We do need to make progress on this issue though, we can’t stick everything in protected areas – that smacks of green colonialism and people need to get resources in one way or another. Idealists may accuse those who work with logging companies of dining with the devil. Fair enough. But we’re not going to solve these problems by ignoring them. Everyone knows about the tropical forest biodiversity crisis. Agricultural conversion, logging and fire are pushing species ever closer to the precipice of extinction, while some have already plummeted over the edge. This destruction is also causing loss of carbon into the atmosphere, contributing to climate change, and changes the ecosystem services we get from these forests. But you already knew all that, right? 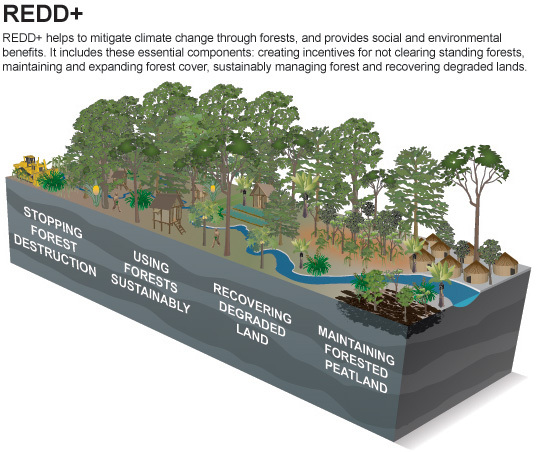 What you may not know about is the Reducing Emissions from Deforestation and Degradation (REDD+) initiative (those of you who do know, feel free to skip ahead to the next paragraph). In short REDD+ is a policy championed by some that aims to reduce the potential emissions from forests, largely by paying communities that live in and around them to manage them sustainably. Of all the tools we could use to help reduce deforestation this policy has been the one to generate most hype over the last few years. I’ve lost count of the number of talks, debates and papers I’ve seen discussing it since I became a PhD student. Though it seems like a generally good idea (and yes I know there are lots of caveats to this), there have been fears about its potential effects on biodiversity. There is the potential that only forests which have high carbon density would be prioritised, thereby missing out large areas with unique biodiversity. This seems stupid for a policy which targets forests, especially when these forests are home to so many unique species. Equally however, just concentrating on biodiversity might not catch areas with high carbon density. It is here where a new(ish) paper by Chris Thomas in Ecology Letters comes in. The paper acknowledges the problems of focussing solely on one goal, and explores how you could balance the two most effectively. To do this they used maps of carbon, along with maps of species ranges in both the Americas and UK. This is, in my opinion, a bit unrealistic since they perceive a world in which protection of carbon everywhere is considered of equal value – at the moment REDD+ is very much targeted at forests in developing countries. Nonetheless, this paper provides a few pointers on how to target this policy. Using the carbon and biodiversity maps they used the program Zonation to come up with areas considered priorities for carbon storage and biodiversity by selecting the 30% of cells with the greatest value. Doing this for carbon solely realised peoples fears about poor protection for biodiversity. In the Americas protecting the 30% of land with highest carbon could protect nearly half the carbon stocks of the continents, but only 34% of bird biodiversity. Similarly in the UK prioritising carbon solely could protect 59% of carbon stocks, but only 25% of biodiversity. 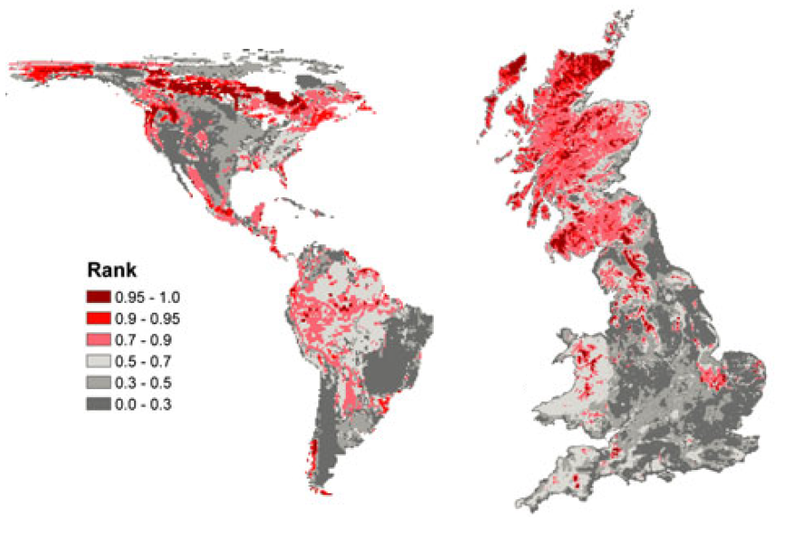 Maps of priority areas for carbon storage in the Americas and the UK. Taken from Thomas et al 2013. The picture was similar when they targeted biodiversity only. In the Americas this would lead to protection of 71% of biodiversity, but only 30% of carbon. In the UK this would protect 93% of biodiversity but only 25% of carbon. 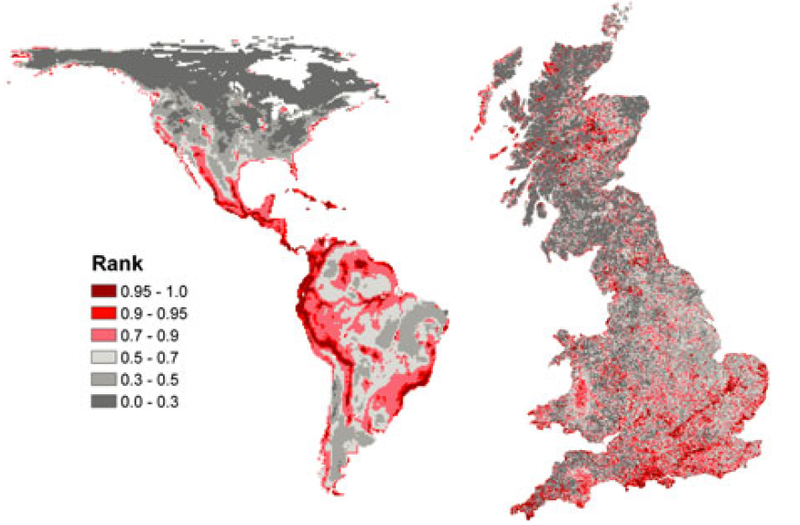 Maps of priority areas for biodiversity in the Americas and the UK. Taken from Thomas et al 2013. Both of these results clearly present a problem, targeting one goal does not automatically mean that you do particularly well with the other even if areas of high carbon tend to be in areas of high biodiversity. 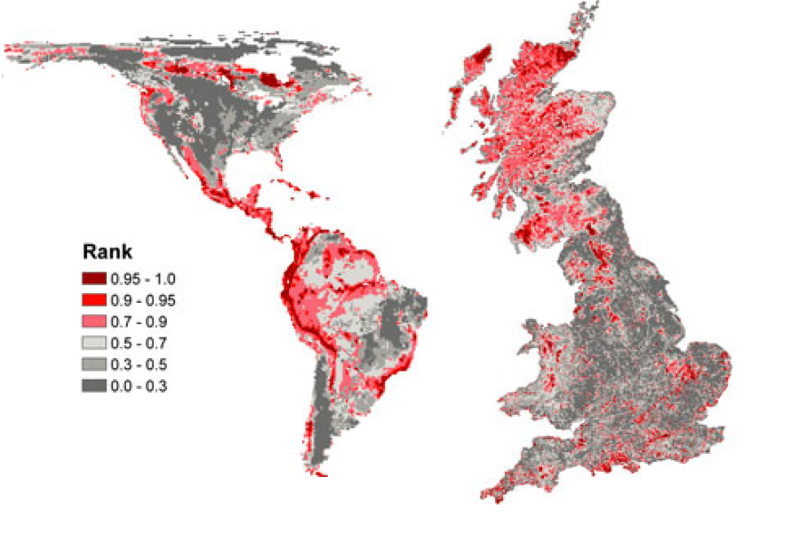 Maps of priority areas which aim to achieve maximal protection for both carbon storage and biodiversity in the Americas and the UK. Taken from Thomas et al 2013. The final analysis they did was to see how well the two goals could be achieved. By foregoing a loss of 10% of the maximum carbon in the America it was possible to maintain 91% of the maximal biodiversity value. The picture was similar in the UK where foregoing 10% of the maximum carbon meant it was possible to protect around 90% of biodiversity. Given the previous concerns about targeting protection of carbon this paper seems remarkably positive. There seems no reason why, with careful and systematic planning, we can’t design policies to protect the two. My criticisms of the paper still hold though, and it seems like a bit of an oversight that someone hasn’t done a similar analysis for countries which will realistically be part of REDD+ in the near future. The Convention on Biological Diversity (CBD) aims to restore 15% of degraded ecosystems by 2020. This is very ambitious. Even by the CBD’s standards. But before we get to how we’re going to raise the money to do this, where we’re going to find the manpower to do all this work and what land is a priority we need to work out what we mean by degraded. A lot of us struggle to define what degraded really means. Don’t worry though, you’re in good company – the CBD don’t know what it means either. 1. Treat or regard (someone) with contempt or disrespect. Looking at the literature a bit further you see that there have been constant attempts to define degraded forests in particular. The latest of these is a forest which ‘delivers a reduced supply of goods and services from the given site and maintains only limited biological diversity.’ This seems like a reasonable starting point. However, it is not particularly useful in practice. What do you use as a reference? In some regions it might be relatively easy to find primary forest but other areas don’t really have undisturbed forest any more. How much biodiversity/ecosystem service supply do you need to lose in order for the change to count as degradation? Where does forest become non-forest? Is there a sensible threshold? 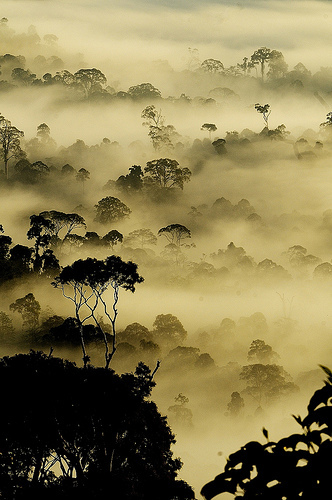 How can we avoid savannah being classed as degraded forest? What ecosystem services are we talking about here? Trade-offs are inherent in any management of ecosystem services so even relatively small changes will reduce supply of one good or another. That’s all I could come up with at the moment. I’m sure there are more. All of these problems, and their lack of clarity in the CBD, completely scupper this 2020 goal. Forest biomes should those be for which it is easiest to define degradation, but this hasn’t been done. Even though I have ranted about it here I realise it is not an easy thing to do. I am not going to solve this with a blog post, which is why I’m going to pursue the topic further in my personal research. I have a few thoughts on how to push things forward as a starter. We need to be pragmatic and we can’t have woolly definitions in important international agreements if it stops us from balancing the needs of humans with conserving biodiversity. Determine reference states for all broad biomes. Only then can we really start to measure degradation. Work out thresholds below which ecosystems should be classed as degraded. This will obviously have to be ecosystem specific. It could include things like magnitude of changes in carbon pools, time required to recover from disturbance or some measure of species community similarity to reference states. Species richness should not be used as a biodiversity metric because many disturbed ecosystems have higher richness that neighbouring pristine systems. We must develop a means of classifying ecosystem types for use in international agreements. Though this is a difficult task as there are many transition ecosystems, we still need to do it. We need to recognise that ‘reduced loss in good and services’ means nothing. If you restore arable farmland to forest you would lose food production. Is this forest then degraded farmland? Obviously not. We must define what ecosystem services we are talking about for each biome and then use these as potential indicators of degradation. We need to develop indicators of degradation since we will not be able to measure everything we would like everywhere. Canopy cover and tree height have been suggested for forests, but have rarely been tested. This list is not exhaustive by any means, but I think its a good start. I am constantly amazed by the ability of those who come up with CBD goals to forget about how we will actually measure progress towards them. I really think this needs to change in the future. For the moment we should try to develop indicators for the 2020 goals. Without them we will have little idea whether we’ve achieved them and what we might need to change in the future. How do we know that what we do to manage biodiversity is doing what we want? The sad truth is that a lot of the time we don’t. A lot conservation management is done in particular ways because of a mate once told the ranger a certain method was good or because they wish to maintain the status quo, but very little is actually based on evidence. The best way we have of understanding the effects of management on biodiversity is through properly controlled studies. Despite the increasing complexity in ecology, which is increasingly resembling a branch of applied mathematics, many conservation questions are about whether treatments a or b are better than doing nothing at all. This is one of the few ways we can attribute causation in ecology and is held as the gold standard for other disciplines. It bears repeating that correlation does not equal causation and most ecology is observational in nature, rather than manipulative. Although there is a push by some to answer these questions and compile evidence for particular management techniques (notably the excellent conservationevidence.com), much remains unevaluated. There is a feeling by some publishers that such experiments are boring and this stops researchers pursuing this type of research as well as reducing replication even when they are published. Though we sometimes have little idea about how to manage biodiversity at the site scale, environment policy can be equally difficulat to implement Randomised controlled trials (RCTs) have the potential to be powerful tools to aid this decision making. Many policy questions relate to how people interact with their environment. For example, is it best to pay up-front for agri-environment schemes or to pay based on the results they deliver? 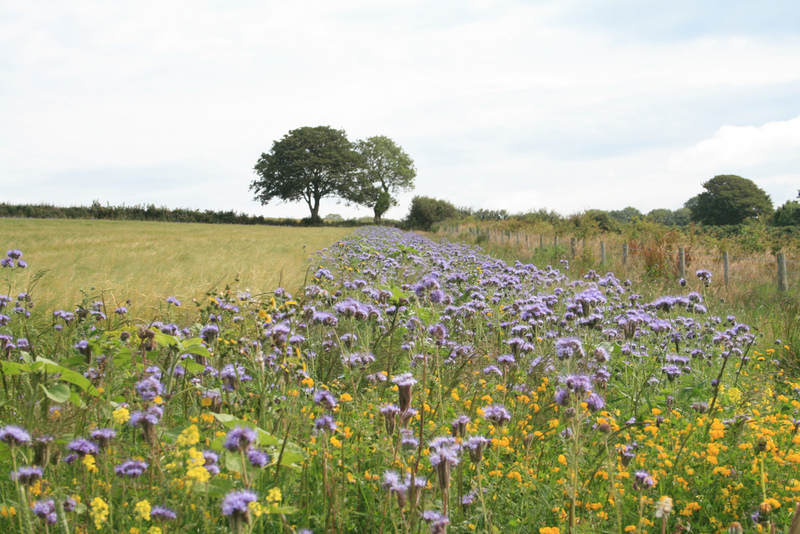 Would it be better to pay farmers up front for planting wildflower margins or should we pay them based on delivery? Questions like this could feasibly be addressed by a large RCT. However, these would need government backing and funding. Some people might see the use of RCTs, when government is cutting such large parts of it’s budget, as an unnecessary indulgence. However, without these trials we are fumbling around in the dark trying to find a sticking plaster when we might be in need of a visit to the hospital. It’s a clumsy analogy but without RCTs of such policy options we do not know whether what we are doing is the best thing to do, or even if it is working at all. This type of thing is being championed by Ben Goldacre and Tim Harford, who argue we should have RCTs for almost everything. Goldacre has also written a report for Cabinet Office in the UK, so it looks like this idea is gaining a bit of traction. RCTs have been identified as having potential for social policies such as the use of different teaching techniques in aiding reading. However, there is no reason why similar trials couldn’t be designed to test environmental policy. This big idea would put an end to uninformed policy making on the environment. It would mean that we wouldn’t have to guess at which policy delivers the best results. Politicians would still get it wrong some of the time but at least they’d be presented with good evidence to help them make these decisions. Politics would still however come first. Making decisions is a messy process and science doesn’t have the last say on such issues. As seen with the recent badger cull debate even the best evidence can have little value when faced with the might of industry lobbyists. But without this evidence, policy making will continue to fumble around in the dark.